Click Here to View our Entry and Vote! The community based map is beginning at the University of Georgia where all of the trash cans and recycle bins have been logged. WeRecycle is developed by the University of Georgia Faculty of Engineering with funding from the Environmental Research and Education Foundation. 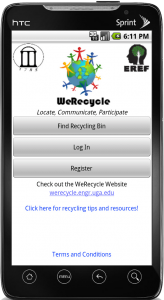 This entry was posted in Apps, Innovative Waste Technology Research, UGA and tagged Android, App, EREF, Kyle Johnsen, Recycling, US EPA, WeRecycle. Bookmark the permalink.